Recently, several members of a vertebrate protein family containing a six trans-membrane (6TM) domain and involved in apoptosis and cancer (e.g. STEAP, STAMP1, TSAP6), have been identified in Golgi and cytoplasmic membranes. The exact function of these proteins remains unknown. We related this 6TM domain to distant protein families using intermediate sequences and methods of iterative profile sequence similarity search. Here we show for the first time that this 6TM domain is homolog to the 6TM heme binding domain of both the NADPH oxidase (Nox) family and the YedZ family of bacterial oxidoreductases. This finding gives novel insights about the existence of a previously undetected electron transfer system involved in apoptosis and cancer, and suggests further steps in the experimental characterization of these evolutionarily related families. A family of vertebrate proteins containing a six transmembrane domain (6TM) has been recently implicated in apoptosis and cancer. Up to date, this family contains four vertebrate members: STEAP, STAMP1/STEAP2, TIARP and TSAP6/pHyde. STEAP (six-transmembrane epithelial antigen of the prostate) was the first described member of this family and identified as a prostate-specific cell-surface antigen overexpressed in cancer, located at the cell-cell junction of the secretory epithelium of prostate, and found as well in both colon and bladder cancer cell lines [1, 2]. STAMP1 (six transmembrane protein of prostate 1), also known as STEAP2, also overexpressed in prostate cancer, has been located in the trans-Golgi network and shuttles to plasma membranes, which suggest a role in the secretory/endocytic pathways [3, 4]. TIARP (Tumor necrosis factor-alpha-induced adipose-related protein) is a cell surface protein induced by TNF-α and IL-6, probably implicated in resistance to insulin [5, 6]. TSAP6 (tumor suppressor activated pathway-6), also known as pHyde [7–10], is a p53 inducible protein which regulates apoptosis and the cell cycle via direct interaction with Nix (a pro-apoptotic Bcl-2 related protein) and Myt1 kinase (a negative regulator of the G2/M transition) . TSAP6 has been shown to be interacting with TCTP (Translationally controlled tumor protein) and could be implicated in its secretion . In this work we present evidence of remote homology of this family to other two families: the mainly eukaryotic Nox and the bacterial YedZ (Fig. 1), both involved in redox functions [11–17]. The Nox family is involved in the production of reactive oxygen species (ROS) [11, 12]. The first member of the family (gp91phox) was discovered in phagocytes and contains an N-terminal transmembrane heme binding domain and two C-terminal domains with binding sites for both flavin adenine dinucleotide (FAD) and NADPH (Fig. 2) [11–13]. Originally, ROS were thought to be used just as a mechanism of host defence. The discovery of gp91phox homologues in several other tissues has suggested their implication in many other functions, such us signal transduction, cancer, mitogenic signalling, cellular growth, angiogenesis, and modification of extracellular matrix proteins [11–14]. Regarding the bacterial YedZ family, the only experimentally characterized member so far is the Escherichia coli YedZ protein, which binds a single heme and is involved in electron transfer to the molybdopterin cofactor in YedY, its operon neighbour gene [16–18]. The exact function of the operon YedZ/YedY remains unknown. Representative multiple alignment of the ACRATA domain. It is viewed with the Belvu program . The colouring scheme indicates average BLOSUM62 score (correlated to amino acid conservation) in each alignment column: cyan (greater than 3), light red (between 3 and 1.5) and light green (between 1.5 and 0.5). The limits of the domains are indicated by the residue positions on each side. The TMHMM helix transmembrane [29, 30] consensus prediction is shown below the alignment. The asterisks above the alignment mark the conserved histidine residues mentioned in the text. Different groups of the ACRATA sequences are shown by coloured lines to the left of the alignment: red, YedZ family; yellow, STEAP family; violet, Nox family. The sequences are named with their swissprot or sptrembl identifiers, and also, if necessary, with their gene name. Species abbreviations: Homsa, Homo sapiens; Glovi, Gloeobacter violaceus; Anasp, Anabaena sp. ; Cloac, Clostridium acetobutylicum; Musmu, Mus musculus; Xenla, Xenopus laevis; Sacce, Saccharomyces cerevisiae; Emeni, Emericella nidulans; Dicdi, Dictyostelium discoideum; Caeel, Caenorhabditis elegans; Drome, Drosophila melanogaster; Arath, Arabidopsis thaliana. Complementary information is accessible at: http://www.pdg.cnb.uam.es/STEAP. Schematic representation of the domain architecture and common features in representative proteins containing the ACRATA domain. The representative sequences selected correspond to: YEDZ, SW:YEDZ_ECOLI; STEAP, SW:STEA_HUMAN; TSAP6, SP:Q80ZF3; NOX1, SW:NOX1_HUMAN; NOX5, SP:Q96PH2; DUOX1, SP:Q9NRD9. NOX1, NOX5, and DUOX1, belong to the Nox family. The proteins are drawn approximately to scale. The domains are named and located according to the Pfam and SMART protein domain databases [34-37]. Abbreviations: SP, SPTREMBL; SW, SWISSPROT. To do the sequence analysis of the new domain we took advantage of the possibility of connecting distant protein families via intermediate sequences  and methods of iterative profile sequence similarity search: HMMer [20, 21] and PSI-BLAST  over the Uniprot 90% non redundant sequence database . We used NAIL to view and analyse the HMMer results . The alignment of transmembrane regions using standard substitution matrices might be inaccurate because of the different roles played by amino acids in globular proteins and in transmembrane media . In the case of the ACRATA domain, the regions to be aligned mostly consist of amino acids located in transmembrane regions (Fig. 1). For this reason, we used a method based on a hidden Markov model (HMMer hmmalign), which does not rely on a general substitution matrix [20, 21], using as a guide both the transmembrane predictions from TMHMM [26, 27] and the results of multiple sequence alignment using T-Coffee [28, 29]. The genomic neighborhood of the bacterial sequences (YedZ family) was analyzed to find potentially related genes in operons using STRING [17, 18]. 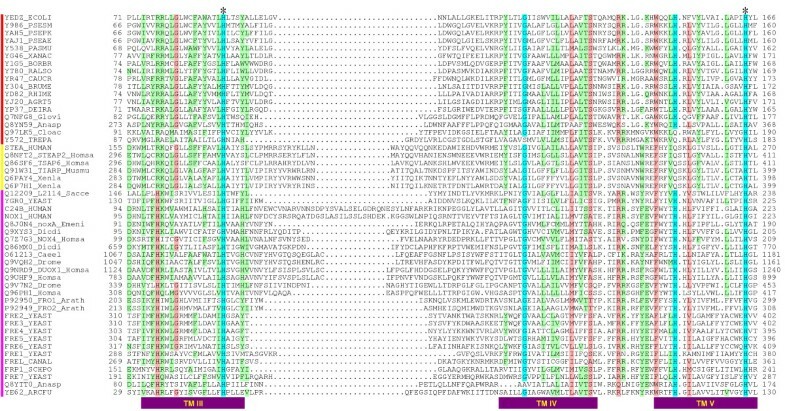 The global hidden Markov profile [20, 21] generated for STEAP and related vertebrate proteins (STEAP family, henceforth) localized the first bacterial sequence (SpTrembl Q7VKI9 from Haemophilus ducreyi) with an E-value of 0.63. This protein belongs to the large YedZ family of bacterial oxidoreductases. The corresponding YedZ global profile detected the STEAP family (most similar member: SpTrembl Q8IUE7, human STAMP1) with an E-value of 0.00087. 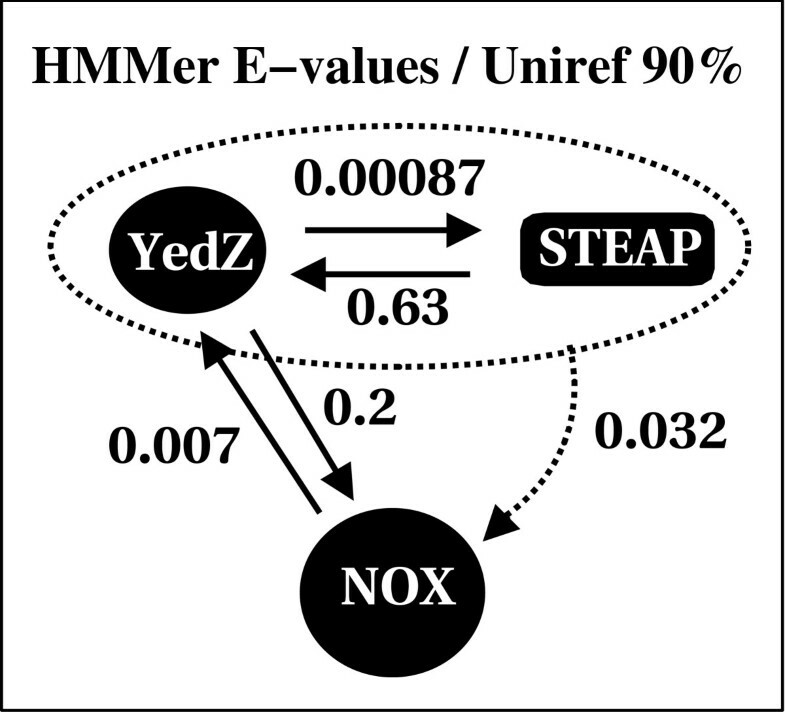 The global profile of STEAP and YedZ detected the Nox family with an E-value of 0.032 and the corresponding Nox global profile localized the YedZ family with an E-value of 0.007 (Fig. 3). Only the regions from transmembranes 3 to 5 were considered to build the profiles because the transmembranes 1, 2 and 6 are highly variable among families. We have named this 6TM domain the ACRATA domain after Apoptosis, Cancer and Redox Associated TransmembrAne domain. HMMer E-Values between the ACRATA domain containing families. The numbers correspond to HMMer E-values from global profile search results [20, 21] that connect independently each family with the others. The arrows indicate the profile search direction, for example: the YedZ family profile search finds sequences of the STEAP family with a 0.00087 E-value and the global profile of the YedZ/STEAP families (dotted line) detected the Nox family with an E-value of 0.032. To investigate the consistency of our results we performed iterative database searches using the PSI-BLAST program . We used as query the most conserved region of the ACRATA domain in E. coli YedZ protein (residues 71–166). These searches detected all of the ACRATA domain-containing families after 15 iterations (using a cut-off of E = 0.005 for the inclusion of retrieved sequences in the profile). None of these profile searches retrieved new unrelated sequences, and reciprocal searches produced convergent results. Therefore, we have concluded that ACRATA is a previously undetected, conserved domain that is commonly found in members of the STEAP, YedZ and Nox protein families. The similarity between these proteins was suspected before . However, no alignment, domain definition or substantial statistical evidence was provided to demonstrate the evolutionary relationships of these proteins. The complete conservation of two histidines in all ACRATA domain containing proteins (Fig. 1) indicates that the STEAP protein family could bind at least an heme group, as was previously experimentally characterized for Nox and YedZ families [13, 16], or for other analogous proteins such as cytochromes . Experimental evidence show that Nox and YedZ families share heme binding capabilities and also involvement in electron transfer chains [11–13, 16]. For the STEAP family, the electron transfer capability is consistent with the presence of an N-terminal cytoplasmic NADP oxidoreductase coenzyme F420 dependent domain, being the only exception the STEAP protein itself (Fig. 2). 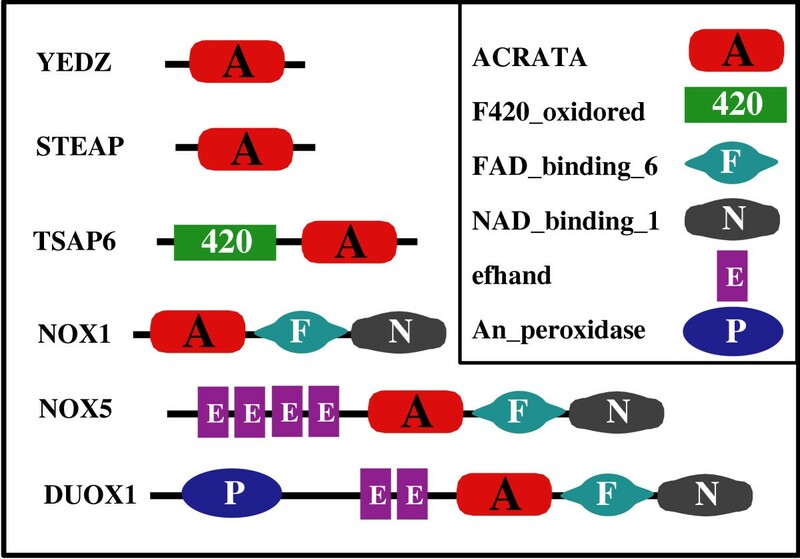 Therefore we conclude that ACRATA domain is a heme binding 6TM domain that originated before the onset of eukaryotes (ancestral, YedZ), transmitted by vertical descent in a conventional manner (Nox family), and further expanded in vertebrates (STEAP family) (Fig. 4). Phylogenetic tree of selected ACRATA domain containing proteins. The scale bar represents the number of inferred substitutions per 100 sites (amino acid residues). 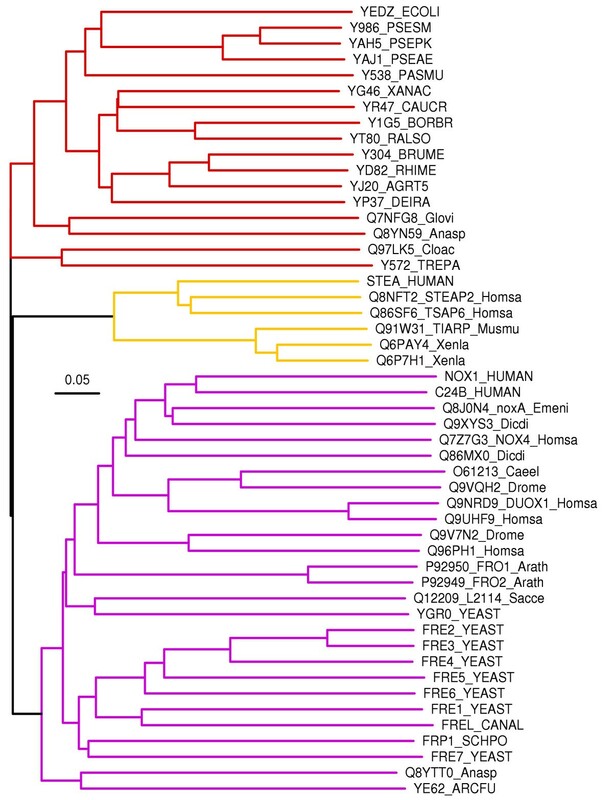 The tree branches for YedZ proteins are in red, STEAP branches are in yellow, and Nox branches are in violet. Organism name abbreviations are as in Fig. 1. We generated trees using a Bayesian, Neighbor Joining, and Minimum Evolution methods, and found that all three gave the same topology suggesting that the overall structure of the tree is correct. For illustrative purposes only the Neighbor Joining tree is shown [38-40]. Although the mechanism of action of the ACRATA domain could be the same in all the proteins containing it, its variable cellular role is made conspicuous by the different effects produced by the modifications in the expression of the corresponding genes. For example, the knock-out of the whole YedYZ operon seems not to affect E. coli in a number of conditions tested (Brokx, S.J. and Weiner, J.H. personal communication). Very differently, changes in the expression patterns of human genes containing the ACRATA domain could be related with apoptosis or cancer [1–14]. The well known functional flexibility of oxidoreductases is exemplified in bacterial proteins such as cupredoxins and cytochromes, normally involved in electron transfer during respiration but that can enter in eukaryotic cells to induce apoptosis or inhibition of cell growth , or in the Nox family, with functions as different as host defence in phagocytes or extracellular matrix modification [11, 12]. We have described for the first time a 6TM domain present in three protein families (STEAP, YedZ and Nox): the ACRATA domain. The common functions of the proteins of those families suggest that this domain is involved in electron transfer, mediated by its heme binding capability. We hypothesize that STEAP, STAMP1, TSAP6, and TIARP have this function, and that they form part of electron transfer systems involved in cellular regulation, apoptosis, and cancer. Additional experimental approaches using different members of the ACRATA domain-containing families are required to confirm these hypotheses. We are grateful to S.J. Brokx and J.H. Weiner (University of Alberta, Edmonton, Canada) for useful comments on early versions of the manuscript. Thanks also to G.R. Reina and J. Menéndez (Hospital Puerta de Hierro, Madrid, Spain) for their encouragement and moral support. LSP, AMR, and MAA carried out the sequence analysis of the domain. LSP and MAA provided with the initial input of the research. LSP, AMR, AV, CMA, and MAA authored the manuscript.